All right, let's get back to the kind of thing I have always loved, and will always love. GOOD OLD EPIC ACTION FANTASY! WOOOOT! It's the big one. The Big Mac, the iPod, the XBox, the hugest cheese in the whole cave, the one and only- well, you get the idea. Chris Paolini took so long on this one I nearly died waiting for it. Then I nearly died reading it. I also cried. I DO NOT CRY AT BOOKS. Not so very long ago, Eragon--Shadeslayer, Dragon Rider--was nothing more than a poor farm boy, and his dragon, Saphira, only a blue stone in the forest. Now the fate of an entire civilization rests on their shoulders. Long months of training and battle have brought victories and hope, but they have also brought heartbreaking loss. And still, the real battle lies ahead: they must confront Galbatorix. Usually my reviews follow a general, if invisible to most people except me, format. I am about to throw this out the window. Into the next field. Where it will slowly sink through the water-logged grass into the depths of the earth. But I digress. Yes, it will be full of spoilers, yes, it won't be very coherent, and yes, it's probably going to be emotional, crazy mush I will delete by tomorrow. I'm going to write it anyway. If you don't like that sort of thing, turn away now. Christopher Paolini, in writing this book you went and ripped my heart into so many pieces I still haven't found them all. Which isn't surprising considering I just got this book today and have already come here to splurge out my feelings and thoughts in some kind of review. ERAGON AND ARYA WERE MEANT TO BE TOGETHER. YOU KNEW IT. WE KNEW IT. THEY KNEW IT. FOR GOD'S SAKE EVEN IF THE DRAGONS KNEW IT!! Okay, fine, maybe they didn't have to traipse off to some mystical, magical other land together, but a kiss would have been nice?! Or even some form of romance other than... well... I CAN'T EVEN COMPARE IT TO ANYTHING BECAUSE YOU DIDN'T PUT ANY ERAGON/ARYA ROMANCE IN THERE! And then you had the audacity, to go and hint at the Nasuada/Murtagh romance and then PULL IT OUT FROM RIGHT UNDER OUR NOSES! NO! THAT IS NOT RIGHT! I love Murtagh. He is my only epic-fantasy-action-novel bad boy and always will be. And you didn't even give him a chance! I want a re-write of the ending! I know that your plot was amazingly brilliant and that all the details were intricate and perfect. To be honest I couldn't help but love every single damn page of that stupid story - but to me the ending just wasn't right! What's all this "I cannot" crap?! Of course she can! They can all do whatever the hell they want after what you put them through! I adored Eragon, Eldest and Brisingr. I even learned how to pronounce and use all the words you put in all three books! Both English, and everything else! The Inheritance Cycle was what prompted me to go get Lord of The Rings, my lovely copy of which sits on my 'favourites' shelf at this very moment! IF J.R.R. TOLKIEN COULD WRITE A HALF-SATISFYING ENDING, WHY COULDN'T YOU? I didn't hate Inheritance. No, no, no, no. I loved it and adored it and was so heartbroken by it that it's just not fair. Chris Paolini, if you even have a heart of your own you will make Eragon instantly regret his decision, want to act on all the emotions he wasted on Arya through each of the four incredibly long books, and turn back to get to her. In Inheritance there was such a positive outlook when he stopped moaning and complaining so much and just got on with the job as well as starting to think for himself, and of himself. He very nearly succeeded in becoming my favourite hero of all time. As did Roran. But Roran is a completely different kettle of fish (at one time I had a debate with my history teacher as to whether or not he would become the next king, let alone the person everyone thought would ebt eh new Rider) and perhaps I will return to contemplate his escapades in Inheritance some other time, when I'm less exhausted. It's not a bad book. If you're not part of the fandom you're probably thinking; why the hell is she screaming and whining so much? It's just a book! 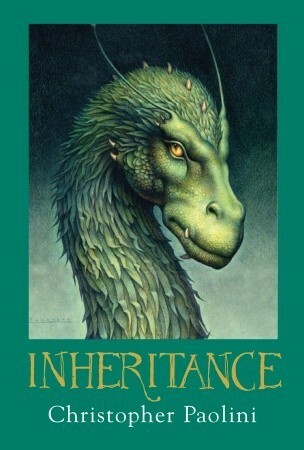 But the thing is, Inheritance isn't just a book. The Inheritane Cycle has never been a series of 'just books'. They are central to a whole new breed of readers and writers who sadly may never return to epic fantasy after the disappointment of, really, just one small part of the story. It wouldn't really have hurt to make them get together, even vaguely, would it? Give us some hope for the future? I'm not reading Christopher Paolini's books anymore. Until I learn the title of his next one. Then I will become re-obsessed. *sigh* How fickle I am.